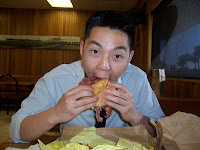 Andrew Hu, a Congressional staffer, says he'll eat most things and "will try anything you put in front of me." i love chicken! do you have any good recommendations for me and my boyfriend, Ozzy?